The rainy spell over Peninsular India has pretty much wound down with mostly dry fortnight on the cards across the region except for some pockets of West Coast along Kerala & Karnataka which is likely to see isolated light rains continue but overall dry weather is expected to prevail as March gives way to April. 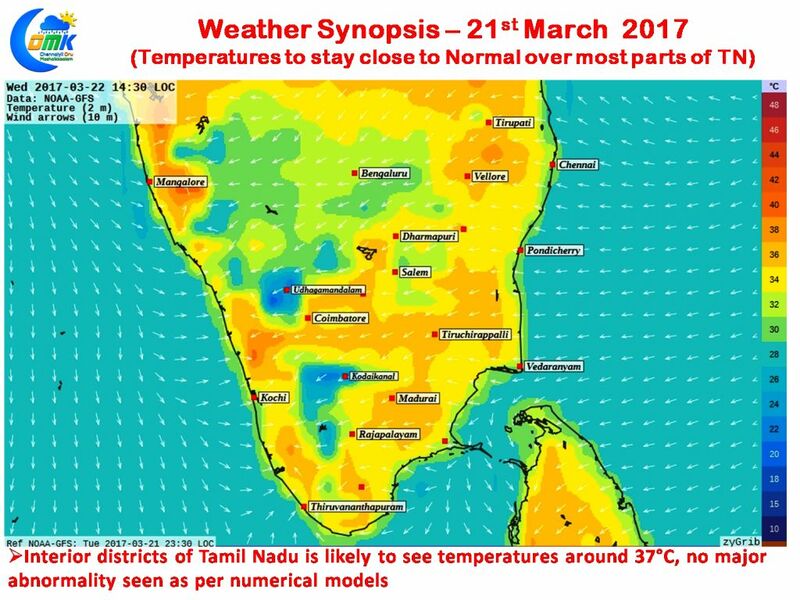 In the meanwhile though dry conditions are expected to prevail over Tamil Nadu as well the temperatures are likely to stay closer to normal as per numerical model indications. While a few places in interior Tamil Nadu is likely to see temperatures in the region of around 36 / 37°C coastal areas are likely to see the day time maximum temperatures stay a couple of notches lower compared to the interior regions. Places like Chennai could see partly cloudy skies which could keep the temperatures under check with maximum temperature expected to stay around 33°C in the city areas. Additionally the Easterly sea breeze is also expected to set in before noon moderating the day time heat.